Create a gift registry with Honey Heart Photography, and let your family and friends help you towards the purchase of your Portrait Collection. This is truly a gift that will last you a lifetime of memories! 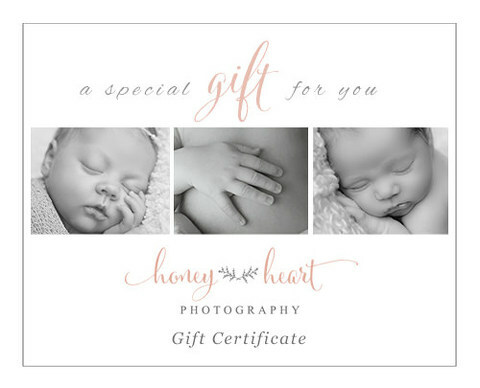 WHAT IS THE HONEY HEART PHOTOGRAPHY GIFT REGISTRY? The gift registry is a complimentary registry for clients who have already reserved their upcoming session with Honey Heart Photography. Registries may be created for all regular portrait sessions that I offer. Creating a gift registry makes for the perfect gift giving to those who would love to gift a session to a friend or loved one. HOW DOES THE GIFT REGISTRY WORK? Clients that register their reserved session with Honey Heart Photography will receive gift registry information to provide to their family and friends. Let your family and friends know that you would love a photography session with Honey Heart Photography and have created a gift registry. Newborn session clients that create a gift registry will receive registry information, and a digital guest registry card that their host may include with their Baby Shower invitations. Your family and friends can purchase a gift certificate towards your registry by completing the gift certificate form on my website, or by contacting me directly. You will receive a gift certificate to present at your session, and their gift to you will be applied to your portrait collection. WHEN TO CREATE YOUR GIFT REGISTRY? Once I have received the portrait agreement and session retainer, you are more than welcome to visit my website, fill out the gift registry form and submit it to begin your complimentary registry process. You will then receive an email with more information regarding your registry. Complete the form below to begin your registry process.